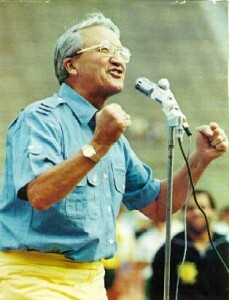 No discussion about Michigan football on the radio is complete without Bob Ufer. Just sayin'. In case you haven't heard, Michigan football and basketball was without a radio contract until just this week. The previous contract expired after the 2010 sports season. However, as you would expect, there was little doubt that Michigan sports wouldn't eventually find a home on your local radio dial. But while we're talking sports broadcasting, we know there are many NFL fans that read this blog. I mean 2011 is the year of the Lions, right? The good people at DIRECTV have a great offer for their NFL programing package that no pro football fan should be without, the NFL Sunday Ticket. They contacted us to help spread the word, so do us a favor and support the people that help support us. Here's a link to the UM/CBS official press release. Below is the list of stations in the local area where you can hear Michigan football and men's basketball. Detroit's WWJ 950 will serve as the flagship station for Michigan sports radio. And for local Ann Arborites, 1050 WTKA will still serve up Michigan sports on gameday.